The Great Barrier Reef is the stuff of marine lover dreams. Embark on a Quicksilver Outer Reef Cruise and you'll get an experience that goes way beyond your fantasies. You’ll be taken to the very fringes of one of Australia’s biggest icons, spending the day floating on a two-storey pontoon atop the coral-clad ribbons of the Agincourt Reef. That’s exactly what I did on our Tropical North Queensland holiday and it gave me the chance to see more sides to the world’s biggest reef than I could ever have imagined: from above, below, when getting wet and even while staying dry. 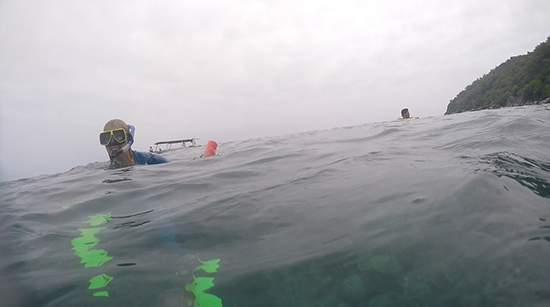 Whether you’re a real water baby or a bit of a Bambi in the sea, snorkelling is one of the most straightforward yet immersive ways to explore the reef. Your first time can be a bit daunting, but the crew on the Quicksilver pontoon will help you choose the right equipment, get you into the water and – much to my dismay – even take pictures of you doing it. Even better, they’ve allocated a specific area just for snorkellers, so you won’t feel like you’re competing for space and you’ll also get to see some of the best corals Agincourt has to offer. Less confident swimmers can even use a flotation aid (or as the Aussies call it: a noodle), so all you have to worry about is bobbing along on the surface and looking at the plethora of fish swimming around you. 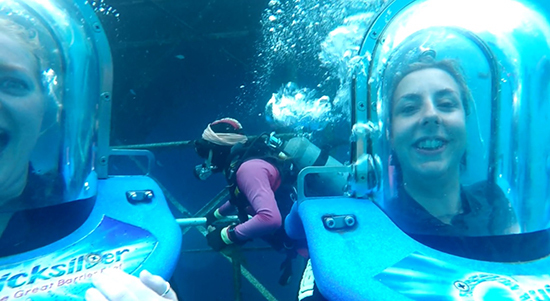 Who doesn’t want to brag that they’ve scuba-dived the Great Barrier Reef? Plus you’ve heard of Finding Nemo right? Well search no more – he’s right here flitting amid the anemones, alongside moray eels, mammoth Maori wrasse, graceful loggerhead turtles and majestic white tip reef sharks. And when you’re swimming seven or so metres beneath the surface, you can get up close to this incredible marine life and the technicolour corals they call home. We're talking real-life Attenborough documentaries, without the need for a HD TV. First-timers can do an introductory dive, while those who are already PADI qualified can bring their licence and enjoy an intermediate experience. Worn out from a morning sunning yourself on the top deck of the boat? 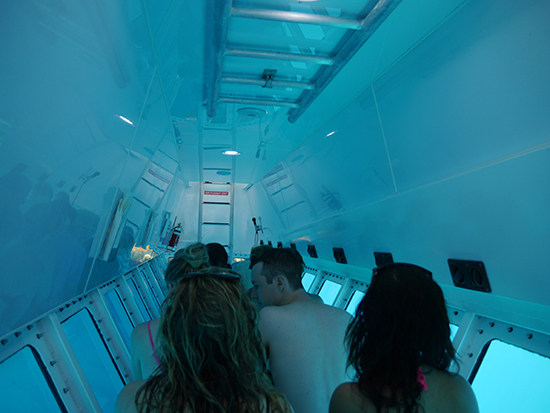 Escape the UV rays while staying dry with a semi-submersible cruise. With its vast glass windows and comfy seating, it’s perfect for viewing corals up close, not to mention seeing more of the reef than you will on a snorkel or dive. And as you head out to the quieter parts of the area, you’re more likely to spot rare sights, like sea turtles, rays and reef sharks. On our ride we saw myriad coral-munching parrotfish just metres from our boat and when the sun shone, its rays illuminated an underwater safari, bursting with colour. Don’t like the water? Don’t worry. My favourite way to see the reef was from the air. Taking off from a floating jetty, the experience is indescribable. 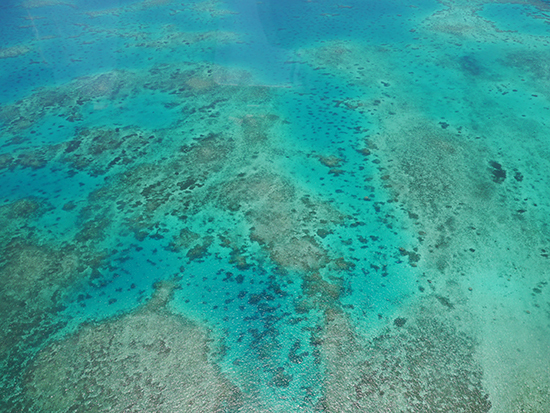 The watery landscape rapidly opens up before you on a 10-minute scenic flight, where you’ll get a unique, memorable snapshot of the coral below; a patchwork of dark shadows and turquoise pockets. And, if you look hard enough, you might even see some bigger marine life too: from sharks to turtles to huge schools of fish. Perhaps the most unusual way to see the reef, Quicksilver’s ‘Ocean Walker’ experience is ideal for those who have snorkelled before, but aren’t quite ready to dive. I’ve snorkelled and dived before, but wanted to try something a bit different – and it certainly delivered. Inside your own Perspex head bubble, you’ll walk down a series of steps that will take you around six metres beneath the surface of the water. 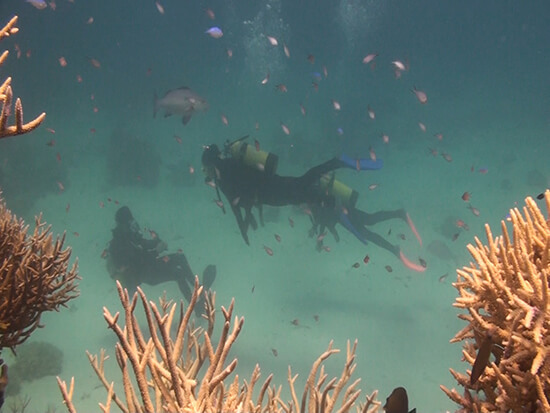 At the bottom sits a submerged platform, surrounded by coral and fish. Your underwater guides will feed the marine life so you’re surrounded by some of the reef’s most colourful fish, before pointing out corals, sea cucumbers and more. Want to explore the Great Barrier Reef? Many of our Queensland holiday itineraries include the above Quicksilver Experience. Talk to one of our Travel Experts today about planning your holiday.